The Powell Bridge is located over Big Sugar Creek 0.4 miles southwest of Powell in McDonald County in the southernmost county of Missouri. It is in the four-state area where Missouri touches three (3) neighboring state: Kansas, Oklahoma and Arkansas. The bridge was built in 1914-15 and was opened to the public in August of 1915. It consists of a 140’ 8-panel pin-connected Pratt through truss main span of wrought iron with a square arch and 70’ 4-panel pin-connected Pratt pony truss approach span, which equals a total bridge length of 210+ feet. It was constructed to have a 12’ wide roadway. The substructure includes concrete abutments, wing walls and a pier cap reinforced with steel plate. The floor/decking is timber deck over steel stringers. The Powell Bridge was initiated by a petition carried by R.H. Buck to the McDonald County Courthouse in June of 1913. 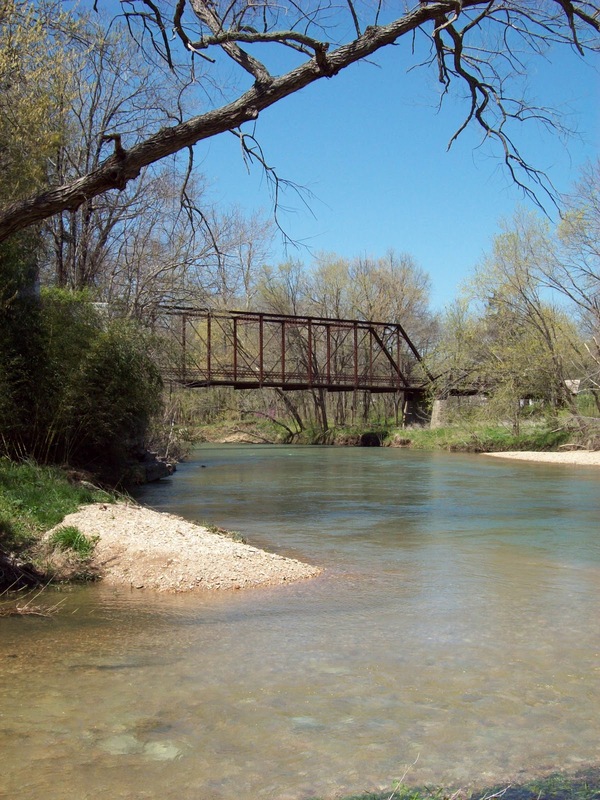 The Court accepted the petition and ordered W. Mose Lett, the County Surveyor and also a Powell citizen, to seek out a site for the bridge near the Bentonville Hollow Ford over Big Sugar Creek southwest of Powell. As the ex-official County Highway Engineer, the Court also requested Mr. Lett to prepare the plans and specifications and advertise for bids for the bridge. The East St. Louis Bridge Co. bid $2,240 for the superstructure of the bridge and Fred L. Appleby of Kansas City bid $1,290 for the substructure. After wood fills and grading expenses the total price of the Powell Bridge was $4,000.00, the total amount of available funds the county had allotted for the project. The Powell Bridge has carried traffic without alteration for 95 years. Recently the tops of the concrete abutments and pier have been repaired with concrete, but the trusses themselves remain intact. While considered in good condition, structural limitations of the one lane bridge preclude modern agricultural equipment use and the heavier trucks built today, including emergency vehicles. A 3-ton load limit has been posted for the Powell Bridge.